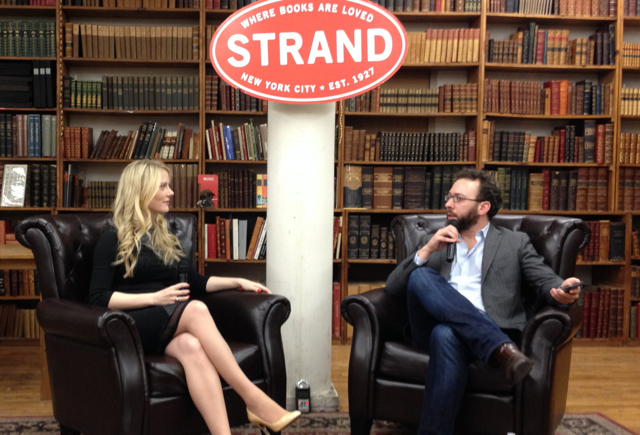 Laura Hemphill read from her debut novel Buying In (November 2013) at The Strand and then had a conversation with Teddy Wayne. Wayne is the author of two novels, The Love Song of Johnny Valentine (February 2013) and Kapitol (2012). Buying In follows a young business woman as she lands her first job on Wall Street. Set in the pre-financial crisis frenzy, the similarities with Hemphill’s own biography are apparent. She worked at a financial firm for seven years before leaving her job to write the novel. She set out to write a story about professional and personal identity and the conflict that often arises because of demands from careers. The novel inevitably confronts issues of gender as the female protagonist, Sophie, enters into the male dominated world of finance. The passages Hemphill reads highlights this latter component with Sophie facing sexism on initiation day at the firm. The comparisons to American university fraternities appear immediately. Fresh from college, Sophie, like Hemphill had, has a job with a financial firm where nine out of ten workers are men. After reading, she and Teddy Wayne take seats and begin discussing the book. Wayne begins by asking what it was that motivated her to write this particular story. Hemphill explains that during her time in the firm, she came to the slow realization that literature hasn’t represented a woman working at a bank. Before her novel, most literary depictions of finance firms are “temples to the male ego.” But Hemphill also wanted to avoid the trap where her heroine ends up quitting Wall Street and opening a cupcake shop. Wayne asks how much of the novel was autobiographical. Certainly there are components that draw from her autobiography, she explains. She was a woman on Wall Street like her character Sophie, but Sophie was able to achieve the sorts of things that she never could. “I could go beyond my personal experience,” she says, such as moments when Sophie explores her co-workers desk drawers. “I had no interest in writing a memoir,” Hemphill says. Besides, she already knew how her story ended; she left the bank to write a novel. She wanted her protagonist to have the potential to stay on Wall Street, and a memoir would have prohibited that. She says none of the other characters are wholly based on any one person. Co-workers hide their personal lives, even though so much time is spent together. She never really knew very much about them. People kept secrets, and when little bits of information did leak out, everyone jumped on it. She did say that once she had a boss who kept a secret, much like one of the characters, and just as her co-workers pounced on that secret, so do the characters in the book. When she started working at the bank after college–like Sophie does in the book–it never seemed like it was going to be a career. She never wanted her boss’s job. Seven years later though, it was harder to say banking wasn’t going to be a career. Still, then, her only experience writing a book was in reading them them. Her first goal was to complete a draft. If she did that in a year, she would allow herself a leave from her job for two years to finish it. She did. The hard part was the day after she left her job. Now she had to write. She enjoyed the process though. Writing was a solitary effort and she says she is a private person. Working on Wall Street meant moving around on a trading floor bustling with other people. When she began writing seriously, she joined Paragraph, the writing workspace in Manhattan. For her, she enjoyed working at the desk that was easily visible whenever people walked in. “I think I work best when there is public shaming involved,” she said. Success on Wall Street is easy to quantify, Hemphills says. Writing is tough to quantify. She started with spreadsheets tracking her progress writing words and pages and chapters. She kept stats on the weather. She tried to understand why some days writing was better or harder. But its mystical, she says. The weather had nothing to do with it. Her only strategy for writing the novel was effort. On Wall Street, bankers pride themselves on finding their edge, the thing that makes them earn profit where others can’t. She wanted to find that with writing but didn’t think she had an edge. She committed to hard work instead writing, editing, and rewriting. Wayne asks her whether the storyline or the characters evolved first. Hemphill says she wrote five drafts before admitting to herself that she had no plot. It was a painful day, she says. She read books on novel writing, but found no solution here saying writers dislike talking about plot. Ultimately she solved some of the problems when she realized that she had too many narrators. The characters didn’t overlap enough in their goals. She had to remove the multitude of voices. And even then once she had settled a plot, it was apparent that the characters had to be adjusted to suit it. The multiple narrators entered the text because although Hemphill wanted a female protagonist, she knew there was more to Wall Street. She felt obliged to illuminate the broader story and bring in the point of view of older, more experienced bankers. She describes bankers as having a thick veneer that they hide behind and the only way to reveal those secrets was to enter into their interior world with their voice. Before opening up to audience questions, Wayne points out that many people compare childbirth and to writing a novel. Weeks before her book’s release date, Hemphill gave birth, and Wayne asks her which was more difficult. Hemphill explains that the galleys for her book arrived just as she began to show her pregnancy. Both suddenly had physicality at the same time, and so both finally felt real. With books though, there are many steps along the process that are their own kind of minor victories: representation, selling the book, final edits, the cover art reveal. Each of these moments had its own kind of build up, and that meant each individual success made the next step seem less disquieting. But “actually holding a kid for the first time was kind of a shock,” she says. The audience begins asking questions. The first is about a character, Jake “Hutch” Hutchinson, who seems least Wall Street like. Hemphill explains that by writing him, then she had been out of banking for two years and felt removed from it. Asked why she thought writers avoided talking about plot in books about novel writing, Hemphill says she believes most writers are afraid of seeming formulaic. She read through screenplays during her search for plot because in those, plot was more obvious. Though she refuses to commit to never going back to Wall Street, she says that it is a place where twenty-two year olds can have a lot of responsibility.